Painting on black gessoed panels makes it much easier to create a painting with a dark background. I like the effects created with the dark background. It puts the focus directly on the subject without distraction. This oil painting is 5x7 inches on a black hardboard panel and is for sale at Small Impressions Gallery for $50.00 plus $6.50 for shipping to US addresses. The panel is 1/4 inch thick, sealed on the back with several coats of acrylic paint, and will last a life time. It will fit easily into a standard frame or might be propped up on a small table-top easel. 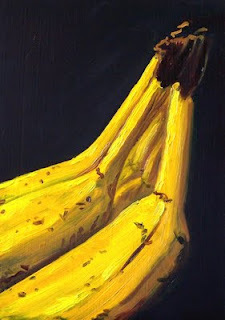 It will make a nice companion to some of my other small still life paintings. Inspiration comes in spirts. Sometimes I am inspired by the landscape that surrounds me, sometimes it is a friendly animal, and sometimes it is the shimmer of light on fresh fruit. 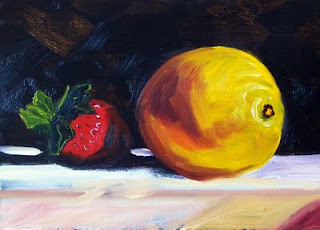 It is the red and lemon yellow under a bright light that spurred my brush to action on this 5x7 inch oil painting. It has been a while since still life painting stirred me, but a recent commission and this little effort has it in my blood again. 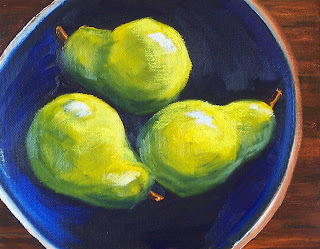 When this one dries, it will probably take a place with my other small still life paintings at Small Impressions Gallery or I might paint a larger version for the still life collection at Impressions Gallery. This is Cheerio. He's the fastest dog at the dog park. 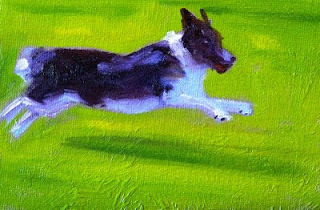 He so impresses me with his speed that I was inspired to paint him in mid stride. He doesn't just run across the field after a ball, he flies. There are points in his sprint where his feet don't even touch the ground. The other dogs know they have no chance at the ball when he's in the park, so they chase him and pretend they are part of the game. When this little 4x6 inch painting is dry, it will be for sale at Small Impressions Gallery along with some of my other small animal paintings. I'm not sure why he is so mad, but I'm thinking it's that evil eye that gives away his mood. Perhaps he's mad because all the chickens can live in backyards and have an easy life in the city, but no one wants a rooster living next door. I imagine if he'd sleep in and stop the early morning crowing, someone might be willing to take him in. He's painted on a 5x7 inch black gessoed hardboard panel with professional grade oil paints. He will be for sale in the Small Impressions Gallery with some of my other animal paintings as soon as the paint dries. The past couple of evenings I have visited the off-leash dog park by he Chambers Bay Golf Course with my daughter and her dog. It is a lovely setting on the shores of Puget Sound and was developed strickly with the volunteer efforts of Sundogs. It is such a delight to see the dogs frolicking, running, chasing balls, and frisbees. At times there is nothing visible but long tounges and wagging tails. But all good things must end as the park closes at dusk. 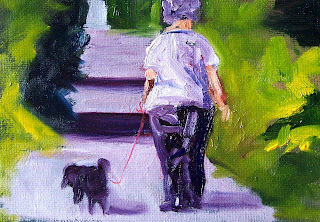 This little 5x7 inch study was inspired by the end of a dog park session as an owner walked her little rascal back toward the car. This little sheep is lost in the crowd. He can't get out and is stifled by the sameness of his peers. I didn't mean to trap him like that, but when my paint brush hit the surface, he emerged--lost and alone--just one of the crowd. He has joined some of my other animal paintings at my Small Impressions Gallery on Etsy and can be purchased for $50.00 plus $6.50 for shipping to US addresses. Canvas or Hardboard--What is the best surface for painting? Today's painting on stretched canvas is an 8x10 commission that I just completed based on an earlier small study. Most of the time I paint on gessoed hardboard panels for my small works because they are sturdy and will last more than a life time. Over the years, it is more likely that a painting on canvas will be accidentally damaged than one on hardboard. Pressure on the canvas can cause puncturing, stretching, or tearing, especially if the painting is moved or placed in storage without proper precautions. I've seen more damaged paintings on canvas than I care to recall. Because of pressure point accidents, I prefer to use a sturdy support. The challenge with hardboard comes with larger paintings. The heaviness of large panels can make them difficult to hang. In that case, canvas is a useful alternative. The new owner-to-be of this painting requested a painting on stretched canvas with painted sides. I understand the logic--no frame will be required creating a reasonably priced work of art. Frames are expensive. Nevertheless, caution is my credo when it comes to canvas. The past few weeks I've really enjoyed creating these little animal portraits. It must be some kind of hangover from the state fair. 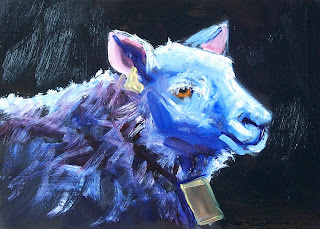 This little fellow is named after Ethel Waters' 1929 song, "Am I Blue?" If you are unfamiliar with the song, listen to it and you will have an idea of the way I imagined this little girl is coping with her blue life. You can download an original version of the song at the Internet Archive . Although the song was recorded by a number of artists including Billie Holliday, Ethel Waters' version is my favorite and fits this little 5x7 inch oil painting well. This painting can be purchased from Small Impressions Gallery for $50.00 plus $6.50 for shipping to US addresses. This morning the sun was shining again and the rains of yesterday gone. With the thought that these beautiful days will be disappearing and replaced soon with the damp days of winter, I got out and enjoyed myself. In the morning the Western Washington Fair was my destination. Visiting the art show, the livestock barns, and snapping reference photos was the order of the day. I'm sure it is the threat of Swine Flu that caused a huge number of hand washing stations to be erected in the livestock area. It's difficult to imagine that these cute little babies can be so dangerous. This one is 4x6 inches on a canvas panel. When he is dry, he will join some of my other animal paintings at the Small Impressions Gallery. This morning it was raining which provided a great excused for me to hibernate in my studio. It was a wonderful day of quiet painting without interruption. 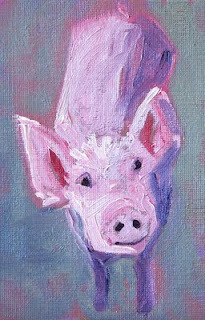 First I finished a commission, then a number of small studies--animals, still life, people--nothing larger than this 6x6 inch painting. Loose strokes and bright color was the order of the day. When they dry, these little gems will probably be placed in my Small Impressions Gallery. I just ordered five new frames for an upcoming small works show. They are standard mahogany frames that will work well with most of my paintings. I've used them before in gallery showings and their universality is wonderful. The trouble I'm having is making a decision which paintings to enter. I pulled some of my favorite paintings off the wall, a few out of my Small Impressions Gallery at Etsy, and lined them up in the living room. I chose five of my favorites from the group, then recruited my husband for a vote for his top five. This 5x7 inch painting is the only one of the dozen that we agreed upon. Choosing paintings for juried shows is one of my biggest challenges. What I prefer isn't always the preference of others. Paintings I think will sell quickly don't necessarily do so. Paintings I don't care for often move quickly out of my inventory. Thus, the collection of twelve will remain lined up in my living room and every visitor will get to vote on their top five. When the deadline arrives, I'll tally the votes, throw the dice, frame up the winners and hope the jurors have taste similar to those who visit me over the next few weeks. This past weekend I visited Chateau Ste. Michelle in Woodinville, Washington and enjoyed the delightful music of Pink Martini. It was a wonderful evening. This morning as I thought back to the experience and the beautiful grounds of the winery, I recalled this 16x20 inch oil painting. It currently hangs in my bedroom, unframed. It's time for it to earn a frame and a more prominent position, so now it is for sale at Impressions Gallery along with some of my other contemporary still life paintings. It is painted on stretched canvas with several layers of transparent oil color and really brightens up a room. I'm finally letting go of this little painting. It was created after a family vacation to Yellowstone National Park in Montana. 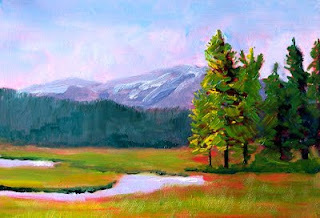 I fell in love with the grandeur and beauty of the park and painted this little 5x7 inch oil painting upon my return. 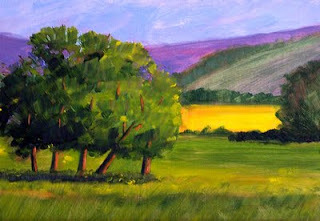 A red underpainting contrasting with the green of the prairie and trees created a warmth that reminded me of summer. The trouble is, I don't have high ceilings or large blank walls in my house or studio. The walls fill up and then I'm out of space. The solution I've developed is to keep some of my favorite paintings on the wall for a while, enjoy them, love them, and then, eventually, move them on to new homes. It is time for this painting to leave the nest. It is now listed for sale in the Small Impressions Gallery for $50.00 plus $6.50 for shipping to US addresses. This weekend was the opening of the Western Washington State Fair in Puyallup, Washington. It is a the largest fair in Washington State and runs from September 11-27. One of my favorite activities is visiting the livestock barns. Cattle, pigs, sheep, goats, chickens, and roosters are just some of the animals that are on exhibit. 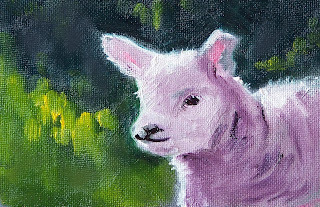 This little baby lamb was inspired by this annual celebration and my visit to the livestock barns. 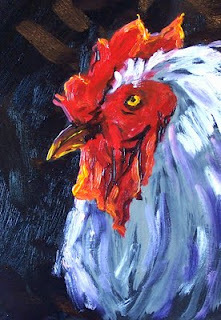 He is painted on a 4x6 inch canvas panel with professional grade oil paints. 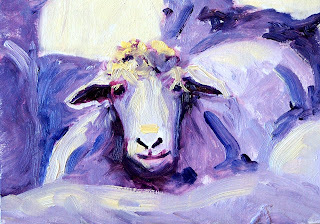 He sold quickly in the Small Impressions Gallery, but there are still several other small animal paintings available at the gallery if you are a collector of small format art. I'm painting on black gessoed panels again. 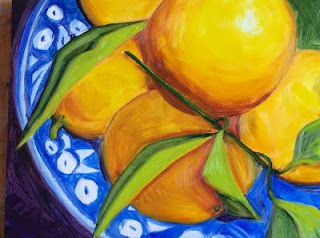 What prompted it is a request that I paint a larger version of one of my small still life paintings. 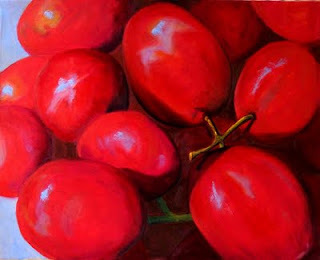 I often use my small paintings as source materials for larger paintings. Since the painting had been created quite a while ago, I had to review it in order to recall the methods I used to develop it. To my surprise it was painted on a black gessoed panel. This made sense. The colors were deep and the mood rather dark and mysterious. 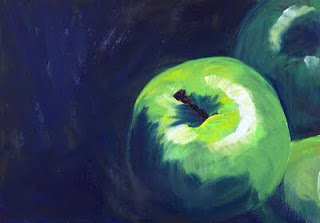 At the same time, from my storage corner, I also extracted this little 5x7 inch apple painting that was also completed on a black gessoed panel. 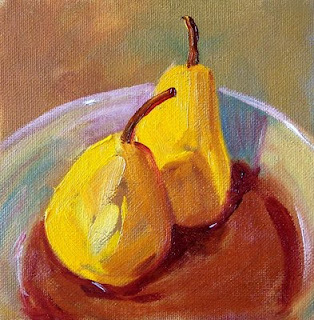 In the next couple of days I will add it to my Small Impressions Gallery where I also sell other small still life oil paintings. Prices range from $15.00 for very small paintings on inexpensive canvas panels to $125.00 for 8x10 inch paintings on hardboard panels. Larger still life oil paintings are available at Impressions Gallery in sizes 8x10 to 18x24. I'm not quite finished with this painting. I like to paint wet in wet, all in one sitting, but when doing so, I have to be careful not to muddy up my colors. I'm please with most of this painting, but I had to stop because I was on the verge of mud making. There are still some touch ups, but it will have to wait a while so I don't make a mess. That's the trouble with oil painting, it takes so long to dry. There are mediums that can be added to the paint to make it dry faster, but they often add a sheen I don't like or dry with an uneven gloss. I prefer paint with no additives. When the painting dries, in a week or so, I'll do my final touch ups. Then it will be another week before I can list it for sale at Impressions Gallery along with some of my other still life oil paintings. This painting is 8x10 inches on a 1/4 inch gessoed hardboard panel. I confess--I'm a dog lover. I enjoy their company and am one who wants to take them all home. It is probably a good thing that my husband keeps me in check and reminds me that they require a lot of care, will wake me early on Saturday, and sometimes are more work than children. We haven't owned a dog for many years and my husband isn't eager to own another one. I often tease him that if anything should happen to him, he WILL be replaced with a dog. 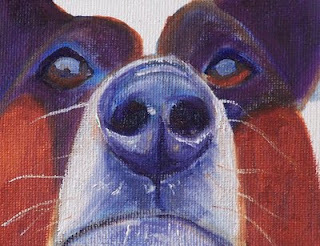 Since we remain divided on our love of animals, I shall have to remain content, at least for now, with painting some of my dog acquaintances. This friendly hound was painted on a 4x5 inch canvas panel. Although he delights me, my stash of finished paintings has grown large and I need to move him to a new home. He is for sale at Small Impressions Gallery for $20.00 plus $6.50 for shipping to US addresses. I'm hoping he finds a new home with people who will love him and take good care of him. I promise he won't wake you up early on a Saturday morning and will be a lot less work than children. It is coming to an end--summer that is. The evenings are getting cooler, the sun is going down earlier, and the kids are heading off to school. 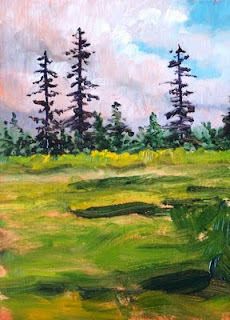 Today's little 5x7 inch oil painting is a good reminder of the days we love--long summer days with warmth and sunshine. If you need a little reminder of the days that will come again, you can purchase this little painting at the Small Impressions Gallery for $50.00 plus $6.50 for shipping to US addresses. It was created with professional grade oil paint on a 1/4 inch gessoed hardboard panel. The painting is sturdy and will last a lifetime. It will fit easily into a standard size frame and is a reminder that summer will come again. This weekend I went to the coast for a get away. Too bad, it poured rain and forced me to the pursuit of indoor activities. As a result, I created this 8x10 inch oil painting based on the current Different Strokes Challenge. 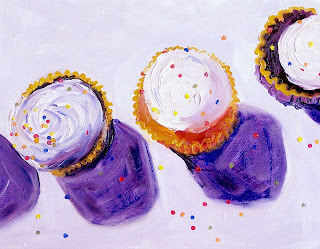 The good thing about painting these from the photo image is there was no chance I could indulge in their sugary sweetness. Today's little painting was based on the view across a prairie near my home where the natural grasslands are bordered by evergreen trees. Many of the natural prairies of the Pacific Northwest are disappearing as housing developments and shopping malls take their place. It felt good to preserve this scene on a 5x7 inch hardboard panel. The painting is for sale at the Small Impressions Gallery at Etsy for $50.00 plus $6.50 for shipping to US addresses. 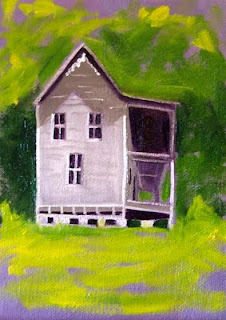 This little 5x7 inch farm house painting was fun to paint. Painting straight lines is always a challenge. There are many ways to execute them from using a mahl stick to a liner brush, and even pizza cutters for the straight-lined rigging of a sailboat. For this little painting, I used a liner brush and free handed the straight edges. The fact that the perspective is a little off and the lines are not absolutely straight is what added charm and created the mood for this little tumbled-down farm house. 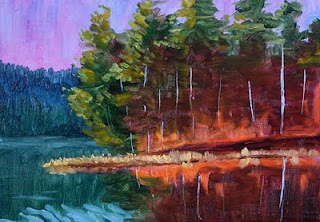 Since it is painted on an inexpensive canvas panel, when it is dry, it will be listed for sale in the affordable Canvas Panel section of Small Impressions Gallery with some of my other canvas panel paintings.